With online lending becoming increasingly popular, India is witnessing a surge in the number of alternative lenders targeting individuals and small enterprises in need of an easy loan. A growing array of online consumers have now begun to embrace the Financial Technology (FinTech) companies as the new game changer of e-commerce payment systems. Today, FinTech is changing the face of the e-commerce ecosystem by offering consumers products at lower cost and higher efficiency, and are disrupting traditional payment systems totally with reinvented payment models. Year 2017 definably marks the beginning of FinTech revolution and an era of online lending innovation, where consumers can get even small unsecured personal loans instantly. Find out why consumers are opting for online lending more than ever? • Influx of personal devices and the Internet can help a consumer apply for a quick loan online The millennium generation comprises the youngest customers of the online lending industry. More and more young customers and lenders are sharing a seamless digital platform, and there is a higher percentage of digital banking users globally, as it is faster and easier to apply for an instant loan online. It is also easy to calculate the EMI using an online personal loan calculator. 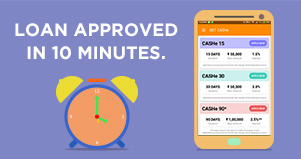 • Transmission of personal loan documents electronically is hassle free Lenders like CASHe have a robust online application process that is streamlined for the user. You could log-in from your mobile and apply for a quick instant loan, and save the hassle of paper work and the back-and-forth with banks. • An instant cash loan is a fast cash that consumers need quickly When you are short of cash, paper work at the banks can delay you from meeting your credit obligations in a timely manner, and you end up paying late fee because of the timing involved in approvals. An online loan application process with a lender is faster than the traditional application process at the banks and empowers you with a decision in minutes. Lenders like CASHe are engaging in mobile apps for instant cash loan and repayment. • You do not need a credit score to avail a small personal loan Many a times, consumers who do not use a credit card, are denied personal loans by the bank because they do not have a credit score, or have never taken a loan previously and traditional credit-rating agencies like the Credit Information Bureau (India) Limited (CIBIL) assign zero score to such consumers. Online lenders bridge this gap by offering instant cash loan to you when you do not have a valid CIBIL score. Non-banking Financial Services Companies (NBFCs) are lenders who create their own scoring system based on the user’s online behaviour pertaining to online payments and other e-commerce transactions, as well as social-media usage. • The Cash on Delivery (COD) system of e-commerce products is better managed for you with concepts built by FinTech companies The Federation of Indian Chamber of Commerce and Industries (FICCI) website states that 60% of all e-commerce transactions are cash on delivery. A large share of e-commerce purchases accounts for returns and cancellations, and therefore FinTech lenders are creating concepts based on credit checks that offer unsecured small personal loans online, thereby minimising issues faced by the CoD payment model. • Peer to peer (P2P) model is modifying the capital provider market for lending With an increasing availability of peer to peer online platforms, there is an overall explosion in the online lending space. Lending is no longer confined to traditional banks or NBFCs. Anyone with a lending capacity can give his cash as credit to the end user as long as he has a NBFC or banking license and the Reserve Bank of India (RBI) regulates the entity holding the credit. Most of the alternative lenders are either marketplaces for NBFCs or NBFCs themselves. There is a growing demand where alternate lenders are targeting consumers or businesses who aren’t traditionally served by the banks. We can help you get an instant cash loan at CASHe now. 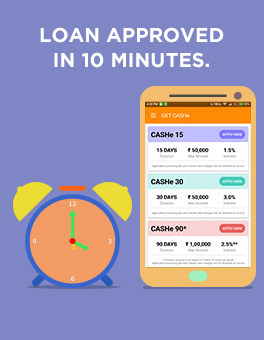 Know more about instant personal loan from CASHe, today.